Yellowbelly Pastel GeneX Pied x het Pied! The season continues! 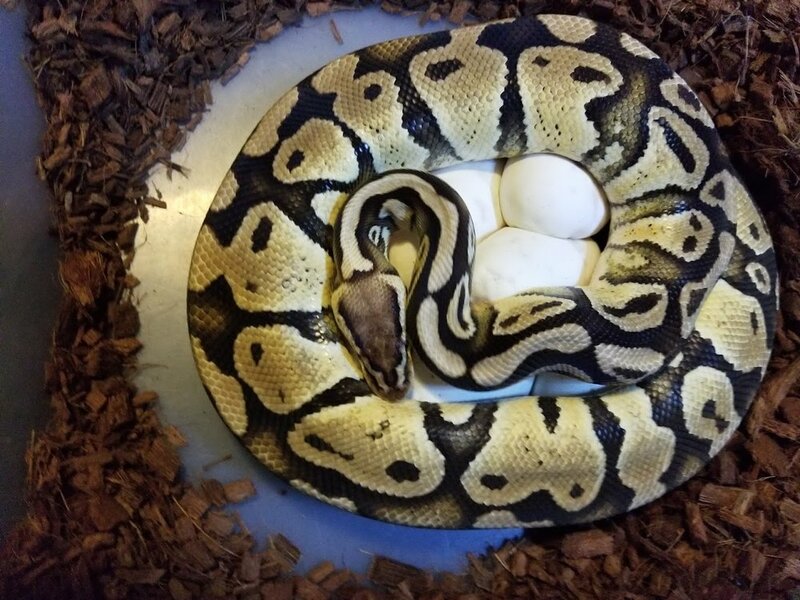 7 big eggs by Yellowbelly Pastel GeneX by het Pied. Clutch #18. I really have no reason to complain, I have had an incredibly steller breeding season. But it still gives you a pang when you see a promising clutch turn into a slugfest. 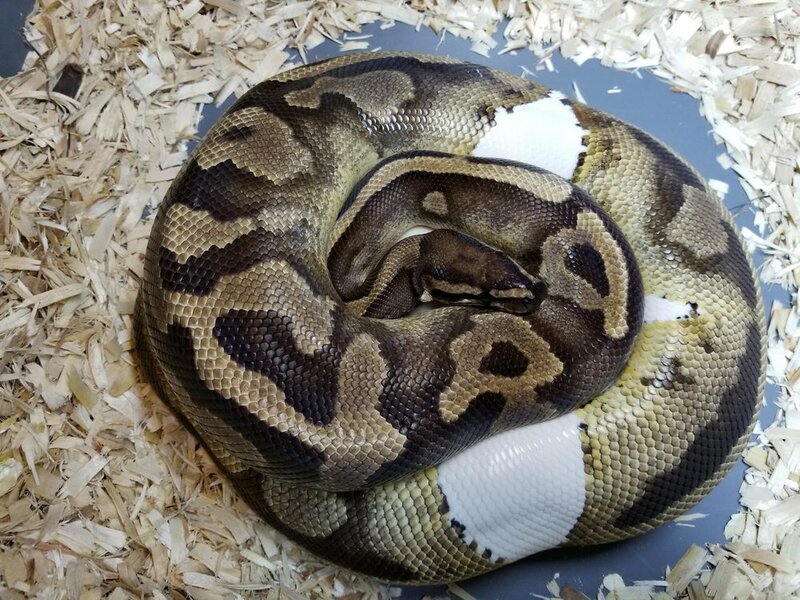 This was the first clutch for this big gorgeous pied girl. And in the past when I have had a lot of slugs in a clutch it seems to be a a first clutch for a young female. This girl is 3, so old enough and she is large- she was 2200g after she laid eggs. So she was viable, but sometimes it seems like a young female just throws slugs. What I got? 2 healthy viable eggs with full veins. 3 beautiful eggs with almost no veins. And 6 slugs.... 6. Eeeessch. Still, she did make 11 eggs. So the promise of next year is pretty exciting! Clutch #17. This lady was just angry at me for coming after her eggs. This was always going to be a long shot at some ultramels but with only 3 eggs its now an extreme longshot... Ah well, can't hit a homer every time you bat! Clutch #16. My first shot at Coral Glow Pieds for 2017! The sire is the first CG Pied I ever produced, back in 2015. This is his first clutch ever. Mom is a het pied, so we should get regular Pieds, Coral Glow Pieds, Coral Glow het Pieds and het Pieds. Clutch #14. This girl has been a bit of a mystery since she hatched. She is a clutchmate from my very first Orange Dream Pied clutch but is her own thing! She doesn't look like a regular Pied but certainly does not look like full Orange Dream Pied either. I'm really looking forward to seeing what her babies look like. The sire is an OD het Pied. So I can get Pieds, Orange Dream Pieds and hets. And who knows what her crazy look will produce! Clutch #12! Het Pied by oh so many possible sires! Het Pied by Mystery Pieds. This girl is a 4 year old who had pulled back a year ago and never laid. 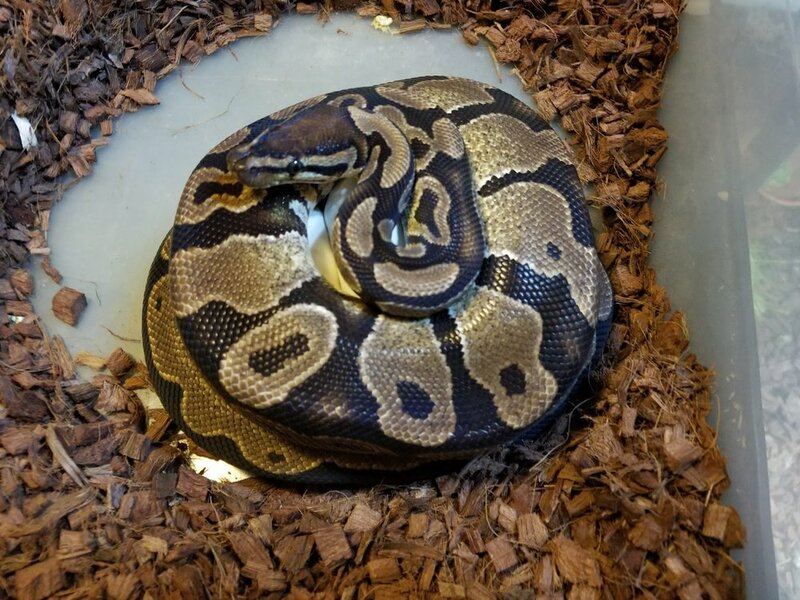 This year I put multiple pied males in with her so we could get regular Pieds, Yellow Belly Pastel GeneX Pieds or Orange Dream Pieds. As always, I lean towards the YB Pastel GeneX Pied being the sire as he just gets things done. 8 big eggs! Clutch #11, 2017. Oh Yeah! Leopard Clown POSSIBLE het Pied x Pied! This will be my first chance to see if my Leopard Clown poss het Pied is actually het Pied or not! 7 eggs by a full pied girl certainly gives me good odds on showing pieds if he is het! Worst case? Everything will at least be double hets or Leopard double het! The third pic is Poppa, check out his ringer! 7 big eggs! More shots at GeneX Pieds! So awesome! Gorgeous eggs in this clutch! We should see some fantastic little lavender albinos out of these ivory beuties in 60 days! That's the perfect egg coil this momma is using, isn't it! Lavender albino x het Lavender albino. Oh BABY! This Clutch! This is IT! My most anticipated clutch of the year!!!!!!!! Every year you have a couple of clutchs that mean more to you than the others. This year THIS is the single most anticipated clutch I have! Laid 5/30/17 this is 7 chances towards a Super Orange Dream PIEDS! SUPER OD PIEDS! In my own head that echoed off into the distance! This is a female that I hatched 2 years ago, who never missed a meal and who bred right off the bat! It doesn't always work that way- a young female may possible not even breed, might not ovulate, or may lay slugs. She didn't! So awesome! I bred her to a male Orange Dream het pied. So the possible outcomes are Orange Dreams, Orange Dream Pieds, Super Orange Dreams, Super Orange Dream Pieds (Oh MOMMA! ), regular pieds, and maybe a het pied or 2. 12 eggs!! Het Pied by Mystery Father! This is going to be a whose Yo' Daddy clutch! 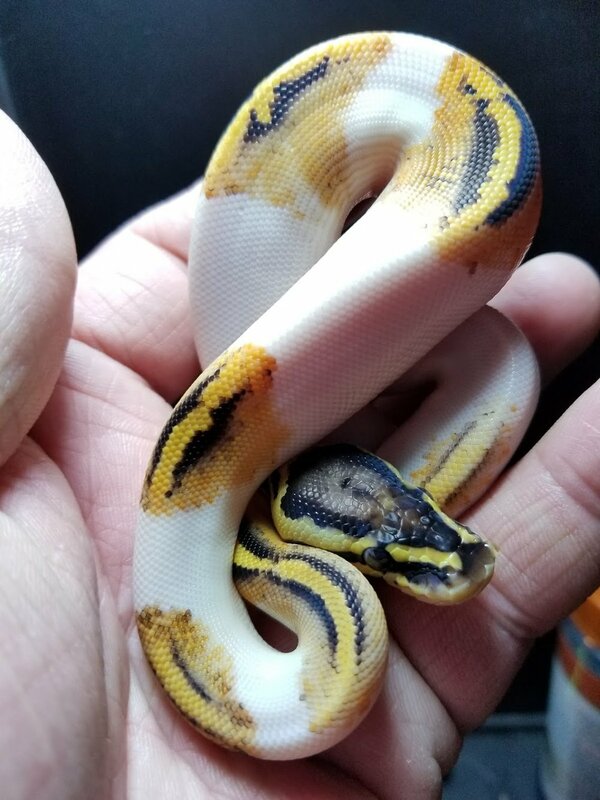 Mom is a het Pied, and I put a Bongo Cinnamon male in with her once with no observed lock, and I put in my awesome Yellowbelly Pastel GeneX Pied in with her and saw one nice lock, and than I put in my Orange Dream Pied male with her twice and saw 2 locks. Now, given the prolific nature of my YB Pastel GeneX Pied male I'm putting my money on him. That guy would breed rope if I let him! But that's whats so cool about a breeding like this! You just can't know what you got until those heads start popping out! Only 4 eggs but oh MAN what the mix could be! Laid May 28th, 2017! She is a Fire, Pastel, Yellow Belly, Spider and the sire is my fantastic Yellow Belly, Pastel, GeneX, Pied! Yeah, I would have liked more than 4 eggs- but 4 eggs is way, way better than NO eggs! 5/30/17 Banana Pastel FEMALE! x Leopard Clown!!!!!!!! So Awesome! One of my top three anticipated cliutches for the year is this one! 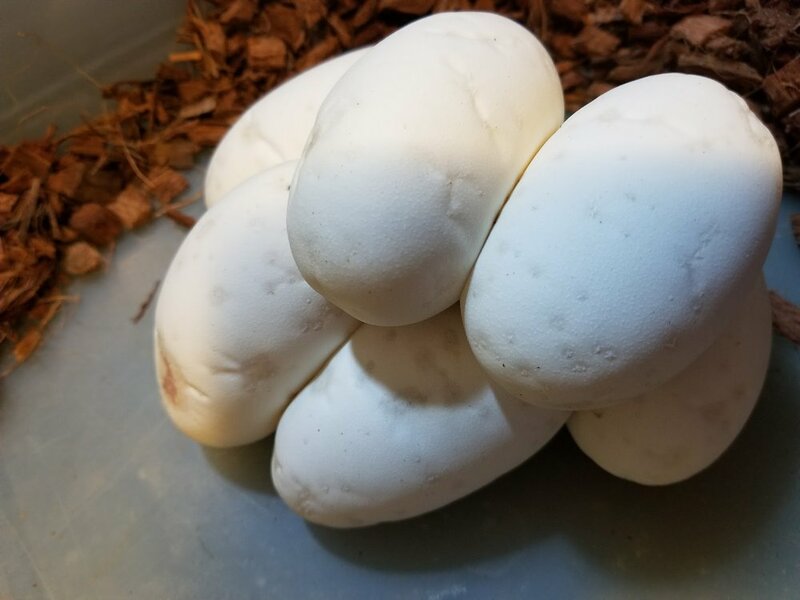 9 eggs that are shots at a male Leopard Pastel Banana het CLown who will be a female maker! Oh Yeah! Another shot at Lavender Albinos! Clutch # 2 Leopard Clown poss het pied X het Clown May 10. 2017. My first shot ever at Clowns! The potential here is for Clowns, Leopard Clowns, Leopard het Clown and het Clowns. 7eggs total, all big, white and awesome. Though only a 4 egg clutch, this small female het Lav Albino makes up for her small clutch size by producing exquisite Lav Albino babies! First up for 2017: Lavender Albinos! This little girl gave me 4 eggs from Lav Albino x het Lav Albino. this is her second clutch and she is a 5 year old. She is just small. She makes up for tiny clutches by producing some of the most exquisite Lav Albinos I have ever made. We shall see what show up at the end of June!